Ever since writing my last post about poached peaches in sparkling wine, we are having splendid summery weather, almost as if the Universe could hear me moaning about the time flying by and was kind enough to make sure the remaining weeks will be scortchiooooo! Let’s hope I didn’t just jinx it! So this is another recipe with the use of booze! OK,very, very small amount of booze, but it will make a huge difference, trust me! The original recipe was found in Delicious Magazine but it wasn’t vegan, so being a kitchen enthusiast that I am, I’ve experimented again with aquafaba, and once again, the results did not disappoint! If you are still unaware of what aquafaba is and how to use it, please read some of my previous posts where I’ve successfully replaced eggs or egg whites with this magic liquid, here are the links to some of them: the fluffiest pancakes everrr , croquettes with sauerkraut and mushrooms, or berry pavlovas. I’m yet to master making macaroons with it, I’ve tried twice so far, and the results were…hmmm…let’s just say ‘unphotogenic’. But other than that, it worked perfectly fine in my culinary experiments so far! And before you ask, no, you can not taste aquafaba in the cakes. In order to have perfectly shaped financiers (they meant to resemble bars of gold), you will need special financiers tin, which is shaped in small rectangles, but as you can see, I did not have such thing (until Thursday this week, when 2 shiny tins arrived to my door), so using small muffin tins will also work. You do not need to know that since these photos were taken, I’ve baked them twice again, with the success of destroying the cakes within minutes (OK, the other half helped, but it was mainly my doings), they are that good!!! 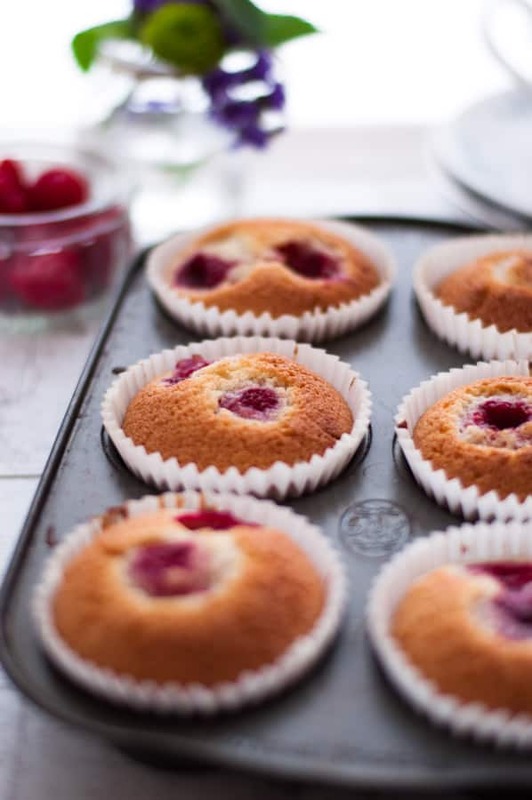 These raspberry and rose financiers are super light and soft inside, with this slightly crispy and crunchy coating on the outside, plus they are loaded with juicy and boozy raspberries! What’s not to love?!? 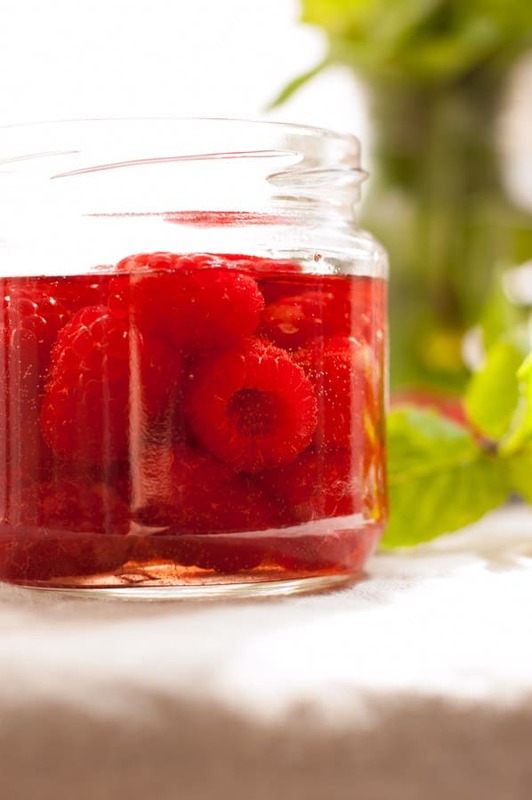 By soaking raspberries in some rose wine, you ensure they stay juicy and will be full of wonderful, delicate and gorgeous flavor, plus they will not burn while baking (I did one version without soaking them, and the raspberries did burn slightly on the top). However, if you prefer to make them without using booze, you can also soak them in some water with sugar, flavored with spices that tickle your fancy. 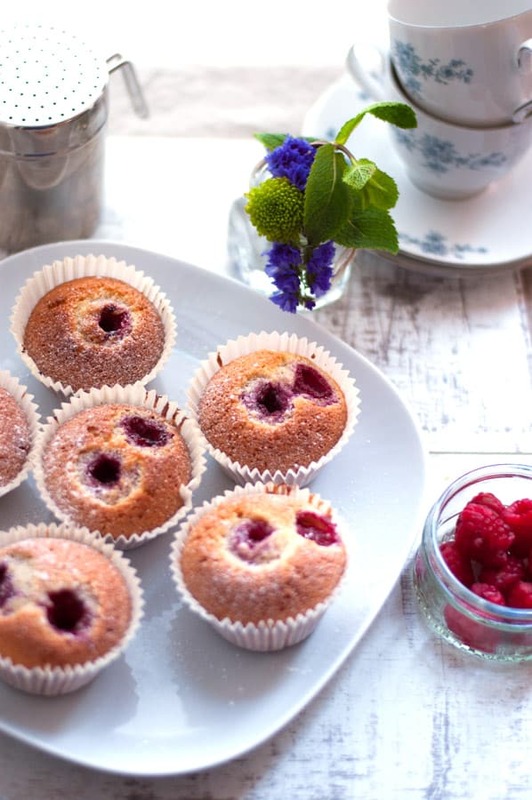 If you are non- vegan and would like to try more traditional version of these beautiful, light and soft raspberry and rose financiers, you can use whites of 3 eggs (rather than aquafaba) and just an ordinary, no salt butter (I’ve used vegan butter or vegan spread in my recipe). They will taste awesome either way!!! Super light, delicious cakes with raspberries soaked in rose wine, made with use of aquafaba, vegan and dairy free. Prepare raspberries couple of hours before. Place them in a small bowl with rose wine and set aside. Put the butter in a pan and melt on a small heat until it's light brown, but don't let it burn. Set aside to cool. Using the electric hand mixer, start beating aquafaba liquid until medium- soft peaks will form, it should take about 8- 10 minutes. In a separate bowl mix together ground almonds, flour and icing sugar. Gently fold the dry mix into aquafaba and mix with spoon in a figure- of- eight motion, add the melted butter and stir until smooth. Put the batter in a fridge for about an hour. 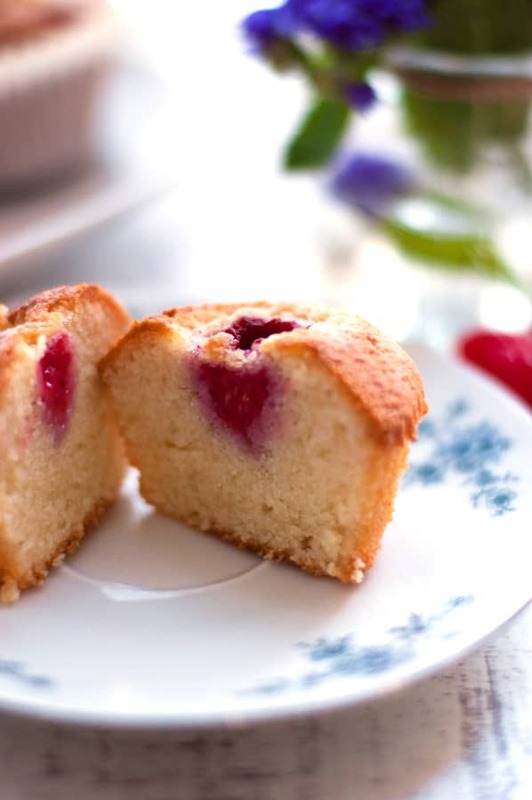 Drain the excessive liquid from raspberries and fill your financiers tins half way with batter then drop couple of rose soaked raspberries on top of each. 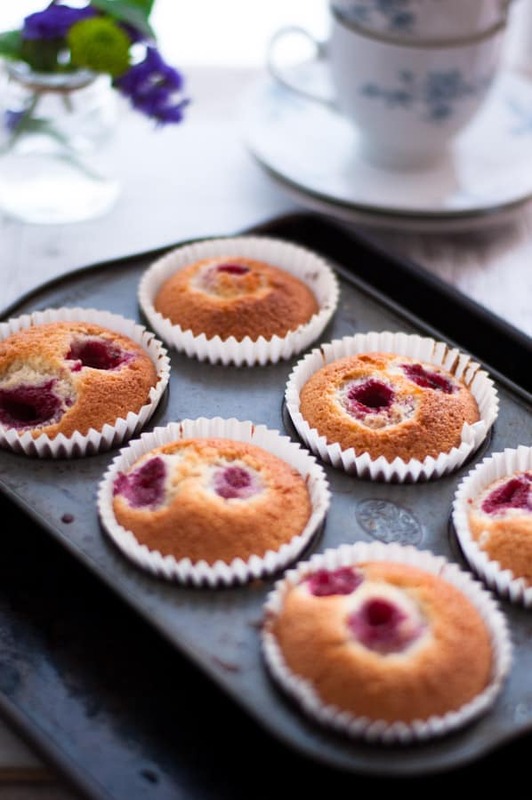 Bake for 25 minutes, then let them cool for about 10 minutes before dusting with icing sugar. I just realized that I haven’t visited your blog since the days you started. Your blog looks good and you have such many recipes already! Isn’t it amazing how people try to replace eggs and then someone finds out how aquafaba works! When I first heard about it I was like whaaaat ? I haven’t tried it yet because the aquafaba goes down the drain everytime and then Im like damn, I was suppose to use it! I think it sounds like the best egg replacer ever! Next time I swear Im gonna try eat, lol! I’ve also tried and failed at macaroons, but am determined to crack the recipe THIS YEAR. So fingers crossed. I’ll report bac to you for sure. LOVE ur page!!! 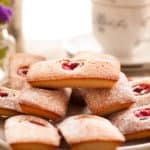 Pls tell me How can I make plain almond aquafaba financiers? So happy to hear that, and thank you! Let me know if you get a chance to try them! But won’t I have to REPLACE that liquid with something else? Pls suggest with what? These look fantastic. I’m new to Aquqfaba. Is there a way to store whipped aquafaba or keep it frozen? And for how long? Hi Lois, thanks for stopping by! Un-whipped aquafaba can be stored in the fridge for few days, you can also freeze it. Once it’s whipped, it will behave just like an egg whites, so it’s best to use while fresh. Hope this helps! 1) do u use it straight from the tin? 2) do U refrigerate it overnight before using? 3) has it been reduced? From or to what amount? Hi Ruchi. I’ve used aquafaba straight from the tin, it wasn’t refrigerated over night, it also wasn’t reduced. Hope this helps! Thanks a lot for ur prompt reply!!! !